Senior Adrian Texidor. He was named the 2018 MAC Defensive Player of the Year. 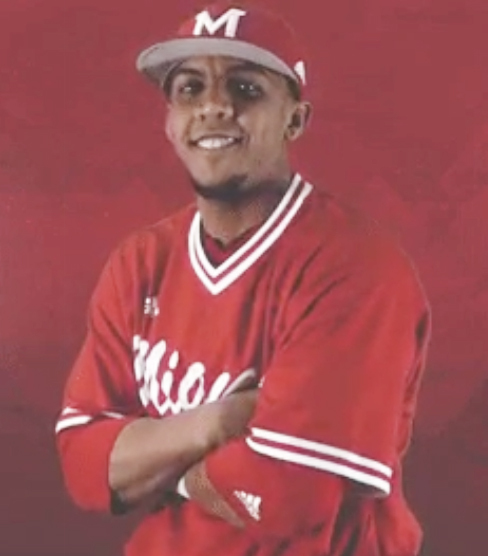 Miami University senior Adrian Texidor, a shortstop on the RedHawks baseball team, has been back to his hometown in Puerto Rico twice since Hurricane Maria struck on Sept. 20, 2017, and left widespread destruction in its path. His father coaches a team that won in Puerto Rico and then went on to become the Caribbean Region Champions. It advanced to the 2018 Little League Baseball World Series, losing to Japan in the semifinals. 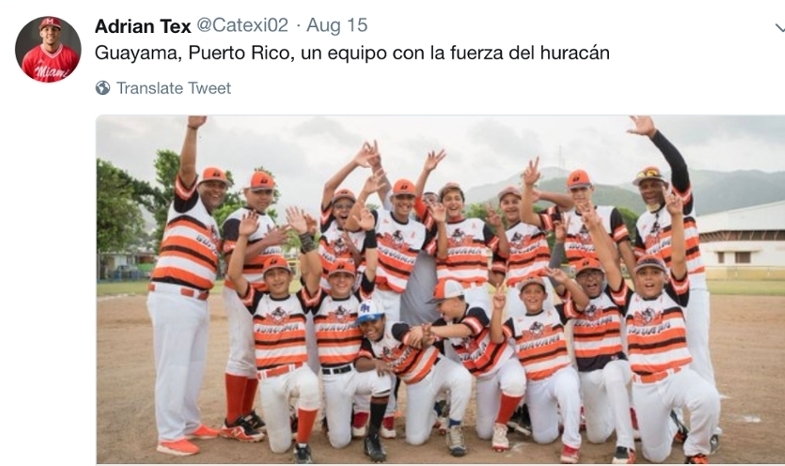 Texidor’s teammate, Wil Vogelsang, reached out to him after the hurricane and they raised nearly $2,000 for those impacted in his hometown of Guayama. 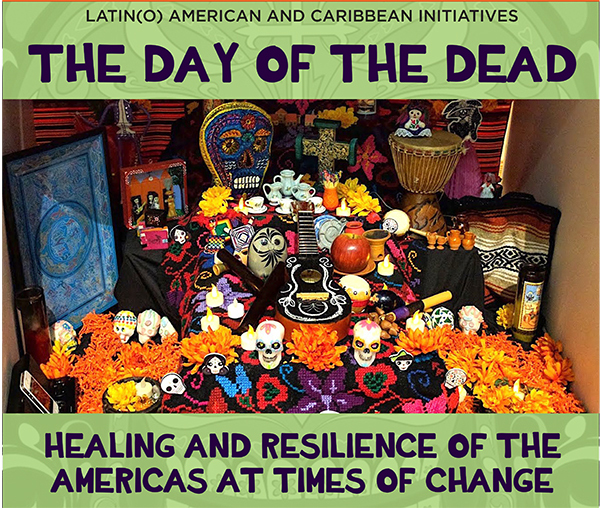 The Miami community became involved in the aftermath of Hurricane Maria in other ways, including a Mapathon and Day of the Dead commemoration. Mapathon team members (left to right) Joanna Camacho, Amélie Davis and Roxanne Ornelas. The 2017 Puerto Rico Mapathon for Hurricane Relief drew 121 participants, including 15 faculty, six staff members, 19 graduate students, 78 undergraduates and two community members. They showed up for several hours at Shideler Hall on Sept. 29, 2017. Similar events were held around the country to “crowdmap” Puerto Rico to aid in the recovery efforts. 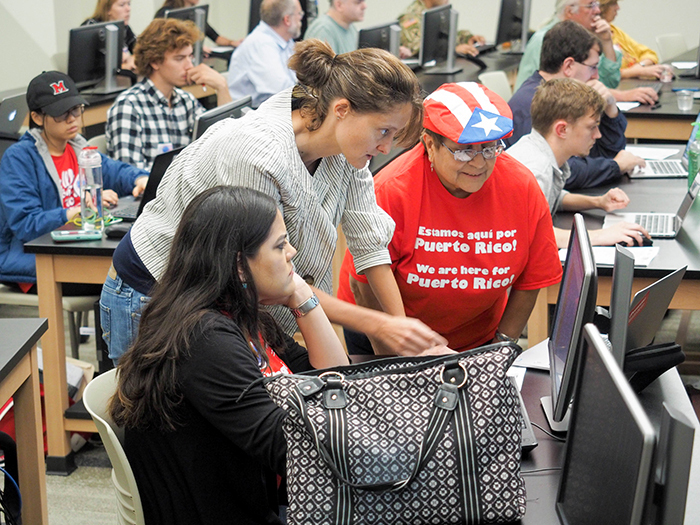 “The willingness of so many Miami faculty, staff, students and community members to be ‘presente” for Puerto Rico was an inspiring show of humanity and compassion on our campus,” said Damon Scott, assistant professor of geography, who coordinated the Mapathon along with Amélie Davis and Jessica McCarty, both assistant professors. The Mapathon demonstrated "the best of ‘Love and Honor’ by bringing together our local community to be of service to the most precarious and marginalized," Scott said. Davis worked through GISCorps, a nonprofit that brings in geographic information systems (GIS) experts as volunteers. They partnered with the organization, Direct Relief, to study Maria’s effects on the health industry infrastructure using GIS software tools. During the Mapathon, Miami students learned to use Humanitarian OpenStreetMap (HOT) to digitize building footprints on a basemap of the island. “The basemap was composed of high-resolution remote sensing imagery of the island taken after the storm that showed the extent of damage to structures on the island,” Scott said. Miami students also learned about the history of U.S.-Puerto Rico relations, including the terms of citizenship granted to Puerto Ricans and the trade restrictions that limited rapid deployment of aid to the island, from historian and Miami faculty member Johanna Camacho-Escobar. GPS, the Geography and Urban Planning student organization, organized several additional mapathon events related to different humanitarian disasters around the world. The group plans to make mapathons for humanitarian relief one of its regular, recurring activities, Scott said. If there are other student organizations that would like to co-sponsor a mapathon, they should contact GPS student leaders or Robbyn Abbitt, the faculty adviser of the group. As a follow-up to the Mapathon, the Center for American and World Cultures, in partnership with the Global and Intercultural Studies department and the Oxford Public Library, spotlighted Puerto Rico as part of its “Day of the Dead” commemoration. On Nov. 1, 2017, an overflowing crowd of faculty, students and community members participated in making an altar to remember the deaths in Puerto Rico from Hurricane Maria and its aftermath, and others. At the time the official death toll was 51, Scott said. That estimate later climbed to 64. Last month, officials in Puerto Rico revised the death toll to 2,975 in the hurricane’s aftermath, the BBC reported.